Sweaty Betty has come back this last week! (not a good look) With the summer heat sweltering down, I’ve been looking for ways to cool off & let me tell you, it’s hard to cool off in Dubai! Having said that, I managed to try something sweet, cool & found something for the girls! Yes there are plenty of activities around town & that’s one of the things I love the most about living here! But when you’re looking for something different from the norm, it’s time to pull up that Abaya & look at alternative modes of entertainment! My second visit to the lovely Tania’s Teahouse in Jumeirah & we got to try something magical – Mermaid Toast! 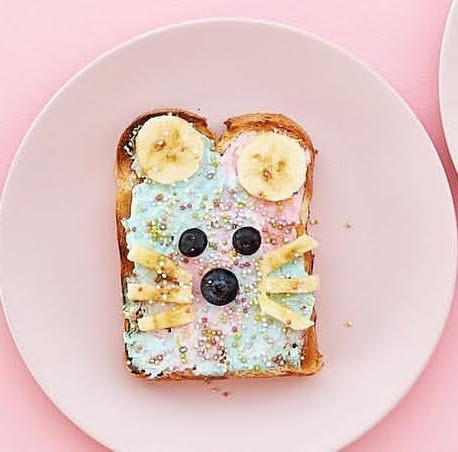 It’s a thick slice of toasted brioche bread topped with magical cream cheese swirled with pastel pinks & blue’s & sprinkles, the perfect breakfast for any yummy mummy, single gal, or sassy 6 year old! As the weather warning was issued in the UAE this week & the UK is apparently going to be hotter than JAMAICA. People have been experiencing extreme temperatures & have been given guides to keep safe. So to keep cool I thought I’d try one of these Cooling Towels. They can be used for fitness, gardening & all around keeping cool (as it’s name suggests) It has a unique mesh design which makes it more breathable than other materials. The soft Ice Fabric cools you instantly to 30 degrees or below average body temperature when wet and typically the towel cools for up to 4 hours. I wouldn’t say it cools for that long as I didn’t use it for quite as long, but it does the job at keeping you cool & I’d say this is really useful for mums with little ones out in the heat! It comes in a nifty bottle so you can hook it to your gym bag or pushchair & the best bit is, it’s cheap & does what it’s supposed to do – win! Enjoy an evening of sipping mocktails, nibbling on award-winning Sushi and Chino-Latino appetizers, growing your social network, and blowing some steam on the dancefloor. On the decks will be DJ Liutik, one of the region’s hottest female DJs. UNVEILED DXB Ladies Only Nights are exclusive and private- so feel free to UNVEIL. Oh yes! They also have on offer, pop up shops, pamper sessions & FREE gift bags! Sold yet? So am I! So there’s my run down on what things I’ve tried, tested & loved this week! Do you have a item or favourite blog/event you would like to see here? If so let me know in the comments below & don’t forget to share!! Next Post 7 Thrifty Kitchen Tips That Will Save You Some Serious Money! The Unveiled DXB event sound so cool! I want you to go so you can give us the scoop. Looks like you’ve had lots of fun things going on! That unicorn toast looks great! And I love that make-up! Going to have to looking to freshening up my look! It has been SO hot here too. We’ve had heat advisory warnings for nearly a month. Its awful. That cooling towel is definitely something that I needed at the racetrack. On another note- How stinking cute is that mermaid toast?? I would totally try that! Thanks for sharing! I always look forward to your posts!